sunshine and whimsy. : a cow's favourite object. At the elementary school where I'm completing my internship, all of the kindergarteners have music class together. That is 60 four and five year olds! Yesterday, the music teacher was a bit late so all of the kids were sitting on the mats and getting a bit fidgety. One of the kindergarten teachers tried to distract them by saying, "I have a joke for you!" This got their attention and they all turned to look at him. 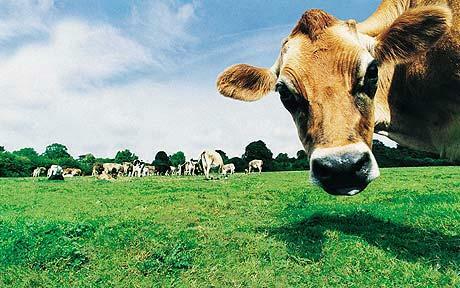 "What is a cow's favourite subject in school?" The kids continue to look at him. One or two kids laughed and the rest just continued to look at him. Tough crowd. When the music teacher arrived, all of the kids turned their attention to her and one of the little boys in my class speaks out, "Madame! Madame! I have a joke for you!" She asks what it is and he continues in one breath, "What is a cow's favourite object? Moooosic!" Of course, all of the kids burst out laughing this time. I don't think they even realized he had made a mistake. It's all about the delivery, I guess.